Only those girls who have passes their higher secondary examination and are from BPL category will get the benefit of this scholarship scheme in Uttarakhand. Two major objectives can be fulfilled through this financial help, first will be continuing the girl’s higher education and the second will be at the time of the girl’s marriage. The scholarship amount which will be provided at a time is Rs. 50,000 per beneficiary. There is an online portal launched by the Uttarakhand state govt. through which the eligible beneficiaries may apply for the scheme. After successful verification, funds will be dispatched through the bank in form of Fixed Deposit, to the address of the registered beneficiaries. The applicant (girl student) must be a permanent resident of the state of Uttarakhand. The students should belong to BPL families or backward communities like SC, ST and OBC categories. Only those girl students who have completed and passed their higher secondary examination from any school which is either recognized by the Uttarakhand govt. or is under state board or central board will be eligible. The annual income of the girl’s family should be below Rs. 15,976 in case of rural areas and for the urban areas, the annual income should be below Rs. 21,206. The applicant must be aged below 25 years as on 1st July, 2017. How to get application form For Gaura Devi Scholarship Scheme? Eligible candidates may visit the online portal – escholarship.uk.gov.in to get details of the scholarship scheme and also download the application form. It is a four page applicant form which is to be filled by the candidate herself and submit through their respective schools. Pradhan Mantri Matritva Vandana Yojana. 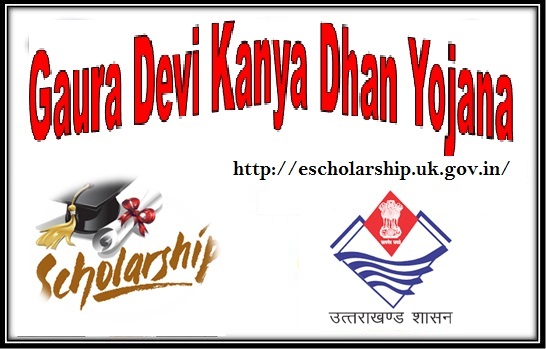 Visit the official web portal of GDKDY scheme – http://escholarship.uk.gov.in. /Go to the Student’s Section where one can start the new registration process. Click on “Application Form” to download the scheme application form. Take a printout of the form and fill all the necessary details like personal details, family details, education details, self declaration carefully. Attach the passport size photograph along with required documents and submit to the school authorities. A budget allocation amounting Rs. 45 crore is made by the Uttarakhand state govt. to be distributed among the girl students who will be applying for the GDKDY scheme. This amount may increase with increase in no. of applications.